If you don't like sims to autonomously Dancing on Toes as much as they do by default, then this mod is for you. First of all, just like TwoJeffs' "No Dancing in Silence", this mod wil NOT allow the "Dance on Toes" interaction (not even user-directed) if there is no Stereo currently playing in the target sim's room. Also, if Seasons is installed, sims will NOT autonomously do this interaction outside in winter. Relaxed test - Males: if this setting is 0, a sim MUST satisfy AT LEAST ONE of the extra tests. If this setting is 1, male sims can Dance on Toes at will. Relaxed test - Females: identical to the above, but only for females. If "Activity enabled" is set to 1, any sim who has enough points in their Lazy/Active personality trait, can dance on toes autonomously. If "Niceness enabled" is set to 1, any sim who has enough points in their Grouchy/Nice personality trait, can dance on toes autonomously. The default settings allow females to autonomously dance on toes at any time, but requires males to pass AT LEAST ONE extra test. Minimum Music & Dance enthusiasm is set to 6, minimum Activity and Niceness are set to 5. NOTE #1: For the minimum values mentioned above, it's important to remember that they are stored as values in the range 0 through 1000, where 1000 corresponds with 10 points in the sim's control panel. So if you want to set a minimum value of 6 points, for example, you use 600 for that setting in this BCON. NOTE #2: Any of the tests ONLY apply to the sim who initiates the Dance on Toes interaction. The target sim is NOT affected by this mod, but will accept or decline according to standard Maxis rules. SPECIAL TRICK #1: If you set "Relaxed test" to 0 for both genders AND disable Music & Dance, Activity and Niceness as well, this mod will completely block all autonomous Dance on Toes interactions. SPECIAL TRICK #2: If you set "Relaxed test" to 1 for both genders, all extra tests will be bypassed, effectively disabling this mod and allowing everyone to dance on toes at will (but only in the same room as a working stereo, and NOT outside in winter). 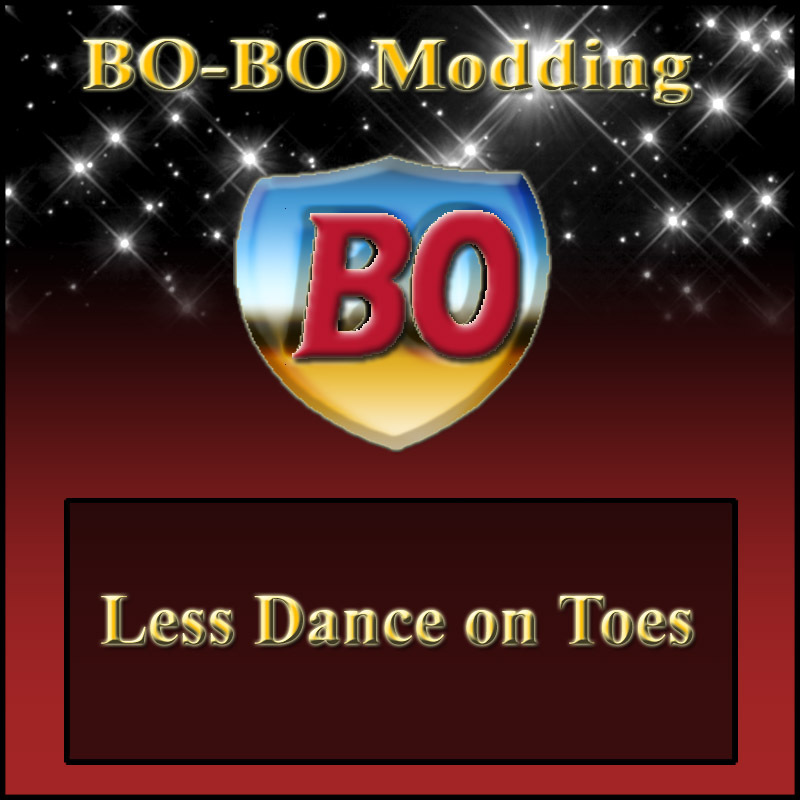 Compatibilty: If you don't have at least OFB, you will NOT need this mod, because your sims can't dance on toes anyway. Also, this mod MUST load AFTER anything it conflicts with! If you have TwoJeffs' "No Dancing in Silence", you can delete that, because it's already included in this mod. UPDATE, Februari 14, 2012: A new Extra test is now available, allowing Outgoing sims to dance on toes, if they make pass the minimum Outgoingness level. Also, a new option has been added to the Activity and Niceness settings: when these traits are set to be mandatory, they are no longer EXTRA tests. In stead, regardless of anything else, these minima MUST be met for the sim to even consider dancing on toes.